When you are developing your projects, designing your games, publishing your apps, there are many tools which can actually help with your development. When you are a small development team or even a one-man band, you suddenly realise how much effort it takes to design and develop games and apps, to which you probably think, surely there is a tool for this and that to help speed up the development… Here I have compiled a list of my Top 10 tools to help speed up the development process. The first on my list is Game Launcher Creator by ByteBox Media. This tool is a must-have for PC/Mac based game developers as it allows you to create Game Launchers for your games in minutes. Lots of game designers and developers, particularly those who use authoring tools or magic editors such as Clickteam Fusion 2.5, GameGuru, FPS Creator, Unity, Unreal Engine, MUGEN and other game engines, don’t have either the time and/or resources to develop a game launcher that will live with their game enabling their users to update the game on-the-fly, choose between Single Player or Multiplayer and have interactive content with the author. This is where Game Launcher Creator (GLC) comes in. It allows game developers to design a complete and professional looking game launcher for their games in no time at all. 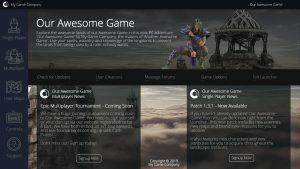 Featuring a WYSIWYG interface with drag n drop capabilities, it allows you to design professional looking launchers with superb state of the art features such as cloud content, server based images, videos, links to websites, forums, buttons for launching games and even featuring a nifty serverside query object (to get realtime information like game stats/servers online) etc. A well developed tool that will save you lots of time and simplify the process, whilst ending up with a professional result. Spriter Pro is a revolutionary piece of artistic software to ever enter the world of game design. 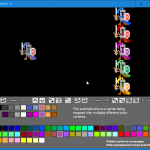 Game artists and character designers have long imagined a software that can do what Spriter can do and so much more. Spriter Pro allows you to piece together character art to create animated sprites in just a few seconds. Spriter’s intuitive interface allows for you to be flexible with your designs, allowing you to create pivotal joints asif you were really animating a 2D sprite, and you are because by the time you export it, you have a fully animated sprite. You can create animations, save animations and then export those animations. There are a ton of options from scaling to forward kinematics. If you are an artist or want to have a go at bringing your characters to life, then you need to check out Spriter Pro. Also features a Clickteam Fusion 2.5 extension. On the opposite side of the spectrum is Spriter Render Kit. A must have for those who model in 3D and are looking for a 2D or 2.5D output. 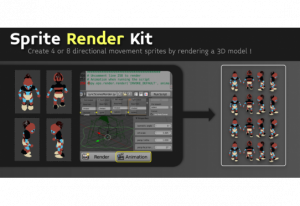 Spriter Render Kit is a sprite rendering kit for Blender. 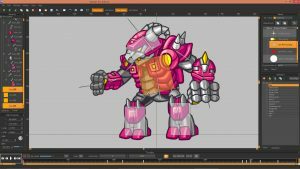 specifically designed to render out animated sprites for 2D games. It basically consists of a huge python script that sets up Blender in such a way that it allows you to instantly export 4 or 8 directions at the same time. Pretty cool? This dirt-cheap tool is available to get now and you can find it in the link below. This nifty little utility will allow you to replace colours in a sprite or animation in just a few clicks. It’s very handy to have if you need to make just colour changes to your sprites. It can be used to convert an image from one palette to another or to create multiple colour variants of an image. Where do I start here? FMOD is an awesome sound effects engine that will allow you to mix and match sound effects to create your own variations for your own game developments. FMOD has been around a while and will continue to dominate in this area. It also allows for team members to collaborate and work on the same material together. 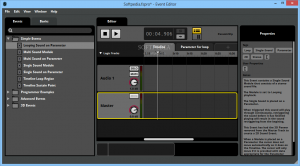 I highly recommend you check out FMOD as it may prove to be an invaluable tool for your audio developments. You may be wondering why I have included Google Drive in the Top 10 list? It’s imperative that you use cloud storage (aswell as local storage) for your game and application developments. Google Drive serves a purpose and it’s purpose is well defined. Backup! Not only is it a fast and useful tool for backing up but also for sharing development files with colleagues or members of your development team. It’s cross-platform compatible, browser-based, mobile based and desktop based. You can be syncing your work AS you work on it. I highly recommend you sign up now for a ton of space and not only that, it’s fairly cheap to go for the Pro plan. I currently have the 100gb plan and it costs me pennies compared to the value of all the work stored on my computer (now also backed up). Clickteam have excelled in more than just the Game Development scene with Clickteam Fusion 2.5. Clickteam produce other software which is development related to and one of the most active and professional ones is Install Creator Pro. This feature-rich software allows you to create your own Windows installers for your games, apps and tools that you develop, ready to distribute to the world. 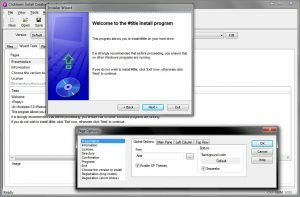 It contains some of the most valuable tools you could ask for when it comes to creating an installer, such as reading/writing to the registry, installing fonts or system files to system directories, downloading serverside files and complete customisation of how your installer looks. Clickteam boast a Free version and a Pro version and this works perfectly with Game Launcher Creator too. Pixel Mash is an innovative image to pixel converter that really does stand out from most previous attempts. There are typically two types of design approaches game designers go for and it’s either Vector or Pixel art. Vector has lots of pros because you can scale, stretch and rotate as much as you want and you won’t lose any image quality. Pixel Art is preferred for some game types as it gives a nice old-skool aesthetic that so many gamers crave. But it also results in distortion when you do want to scale, rotate or stretch as it’s based on art pixel by pixel. So previous attempts at creating conversion software that will allow Vector > Pixel art conversion has always been a tough nut to crack because you have to get it right, otherwise it’s just not worth using. Pixel Mash does this to the best degree I’ve seen in a long time. It’s well worth checking out. You can produce some amazing results with it. This is an awesome little software. Pixel FX Designer allows you to create awesome pixel-perfect animations with lots of special effects too. The whole thing works in real time and you can export out without effects, with effects, without pixel art conversion or with pixel art conversion. You can create some awesome particle looking effects which makes designing real easy. A huge plus if you’re already a competent designer. What a way to finish off my article than introducing you to a royalty-free collection of free music and sound effects for use in your games. This website contains a stack of free sound effects for you to download and use freely in your projects. So that wraps up my list for today. If you have any additional tools you would like to share, drop a comment below! 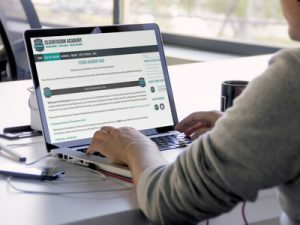 Are you a Pro member of the ClickFusion Academy yet? If not, you are missing out on lifetime access to over 19 hours worth of video tutorials, lots of written tutorials, downloads, examples and libraries! 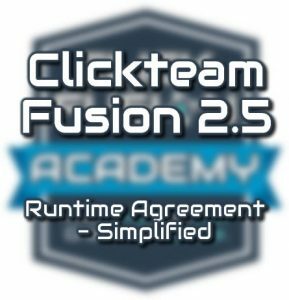 Upgrade your skill level with Clickteam Fusion 2.5 today by joining the Official Academy. Click here for more info.